When Tessie King inherited the Royal Palace Hotel, Lake Tahoe's biggest resort, she inherited a cranky board of directors along with it. A board that is demanding higher revenues, or Tessie's out. Faced with the possibility of losing her father’s legacy, Tessie turns to her staff to help her come up with a plan: film the season finale of Battle Buffet, the hottest cooking competition show on TV, at the resort. It's a scheme sure to bring in the big bucks. But is also brings big trouble. When one of the casino’s wealthiest clients is found dead on the gaming floor, and the killer comes up incognito on the security footage, everyone is a suspect—from the television crew to the blue haired retirees at the slots. 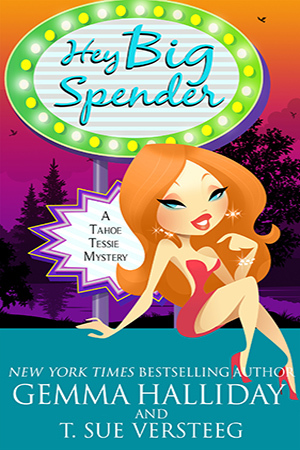 Tessie teams up with her stepmother-turned-BFF and her snowboarding teenage crush in a race against the clock to repair the casino's reputation, dodge mob accusations from the hot FBI agent on the case, and track down a killer before any more of her big spenders end up sleeping with the fishes.